Washington, DC —September 26, 2018—The Asbestos Disease Awareness Organization (ADAO), an independent nonprofit dedicated to preventing asbestos exposure through education, advocacy, and community work, today announced that it is submitting a petition to demand the EPA give Americans better information about the deadly asbestos being brought into the U.S. This “Right to Know” petition, submitted to Acting EPA Administrator Andrew Wheeler by ADAO and five other leading environmental and public health organizations, calls on the EPA to do its job and protect Americans from this toxic substance. 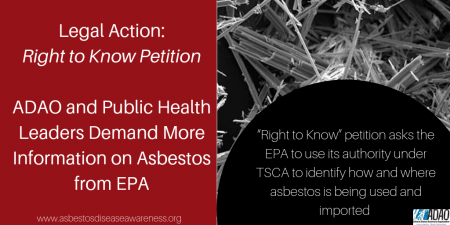 Specifically, the Right to Know petition asks the EPA to use its authority under the Toxic Substances Control Act (TSCA) to require importers and users of asbestos and asbestos-containing products to report on their activities and disclose these reports to the public. ADAO, together with other petitioners including American Public Health Association (APHA), Center for Environmental Health (CEH), Environmental Working Group (EWG), Environmental Health Strategies Center (EHSC) and Safer Chemicals, Healthy Families (SCHF) will deliver the petition in a letter to Acting EPA Administrator Andrew Wheeler today. The petition is based on section 21 of TSCA, which enables citizens to petition EPA to require industry to file reports under the law and requires EPA to respond in 90 days. If EPA ignores or rejects the petition, the petitioners can file suit to compel the Agency to act.  The petition urges EPA to undertake expedited rule-making to subject asbestos to the CDR. It also asks that the revised rule trigger CDR reporting on asbestos immediately, including imports of asbestos-containing articles and those contaminated by asbestos, and require reporting by processors of raw asbestos and asbestos-containing products. The petition asks that all reports be disclosed without regard to claims of confidential business information (CBI) so that the public is informed of where and how this dangerous substance is being used. Asbestos is among the most dangerous chemicals ever produced, with expert bodies agreeing that there is no safe level of exposure. Recent research indicates that nearly 40,000 asbestos-related deaths occur in the US each year. Yet importation and use of asbestos are legal in the US with limited exceptions.